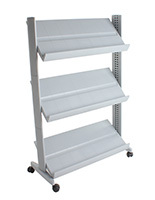 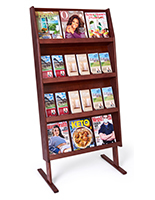 This wooden 4-shelf leaflet stand features an open-shelf design that allows for the placement of different types of literature on one tier. 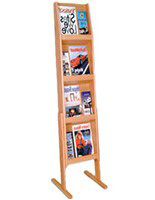 The magazine rack is made of solid oak and is very durable to last through placement in busy customer traffic settings. 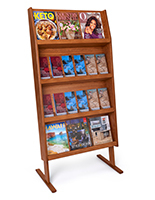 The leaflet stand with red mahogany finish is able to coordinate well with the interior décor in many reception areas and lobbies. 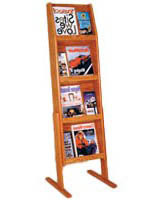 The magazine rack is able to fit 3 brochures or 1 flyer and 1 pamphlet side-by-side on every level because they are 13.5” wide. 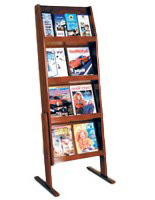 The stand includes wide legs to help stabilized the design so it is not easily tipped over. 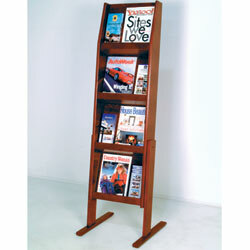 The oak literature holder has no front panels and so is best used with sturdier, more rigid materials.